Three hundred kilometres south west of Darwin is Peppimenarti. 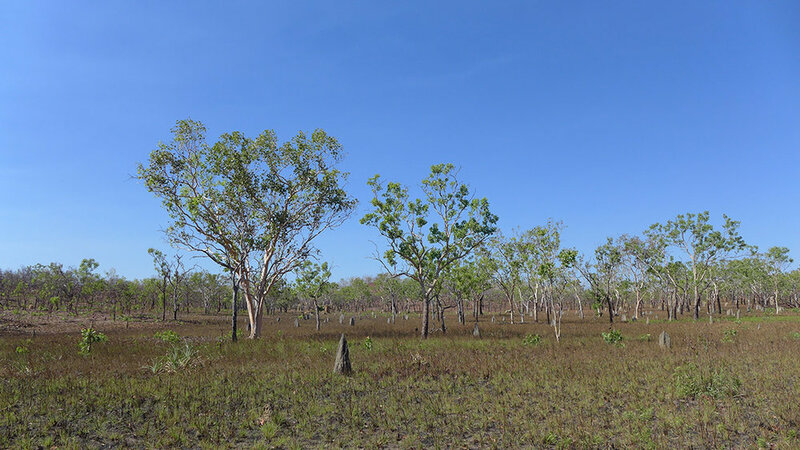 This tiny community of approximately 200 people was originally established as a cattle station for the local Ngangikurrunggurr people and has since become a 2,000 square-kilometre permanent Aboriginal settlement. ‘Peppi’ translates as rock and ‘menarti’ as large, referring to the rock formation that overlooks the community. 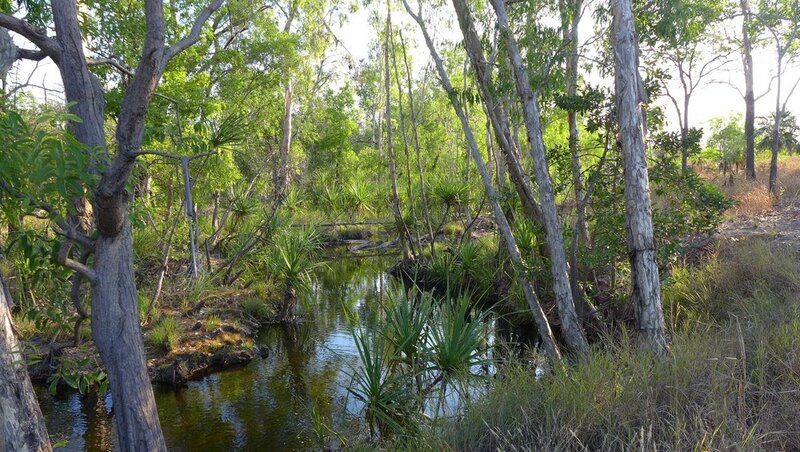 At its base is a wide stream and a series of pools which is a significant, sacred site. There is road access to Peppimenarti seven months of the year with the remainder being flooded during the wet season, or roads in too poor of a condition to travel on. The only access to Peppimenarti during the wet season is via plane. The climate is hot and humid. The soil is a rich red colour. And the vegetation is lush and wild. Durrmu Arts Aboriginal Corporation is the beating heart of Peppimenarti. It is a well run and very successful art centre that has channeled their traditional craft practices into contemporary art. Koskela has been working with them for 10 years. In 2011 we collaborated with their best known artist, Regina Wilson, on a limited edition range of fabrics. Her paintings were some of the first in Aboriginal and Torres Strait Islander art to represent the craft of weaving as contemporary art. To get an insight into the inner workings of this impressive organisation, we fired off some questions to Kade McDonald, their Executive Director, who is responsible for the day-to-day running of Durrmu Arts. 1. What is the purpose of your art centre? 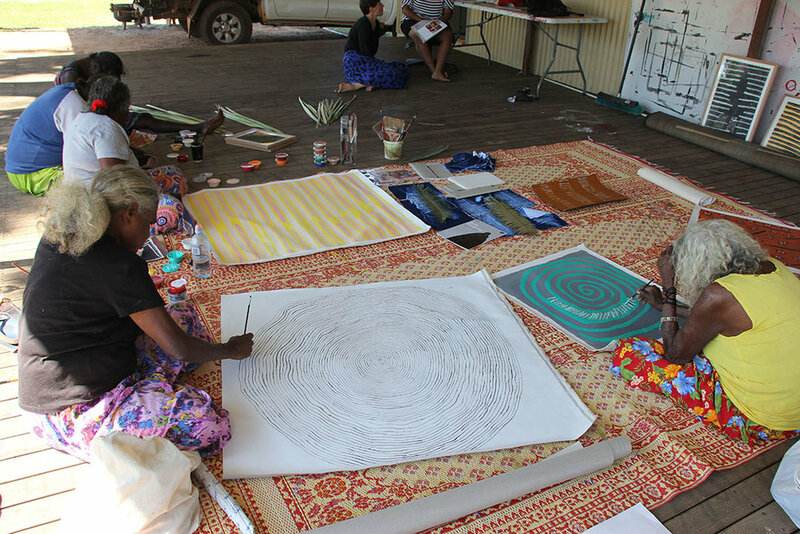 The purpose of the Durrmu Arts Aboriginal Corporation is to support the Peppimenarti community to participate in cultural practices that continue the traditions, language and ceremony of the Ngan'gikurunggurr people of the region. Along with managing and promoting arts and crafts made at the art centre, Durrmu also seeks to create projects that benefit the community as a whole. Educational activities, workshops and training programs are established to build capacity, knowledge and employment opportunities. We act as a key stakeholder in maintaining culture within the region for the next generation. 2. How does the art centre benefit the community? Durrmu Arts supports and guides the artistic production in the community, boosting the production of both paintings and fabrics that are developed there. In the same way, the art centre plays a role of distribution at a national and international platform, allowing the opportunity of economic security for participating cultural practitioners. 3. What styles and/or mediums is your art centre known for? Durrmu Arts is renowned for its fine, contemporary art production, including acrylic painting and fibre work. The paintings of Peppimenarti are based upon traditional weaving and Durrmu (body painting) designs. These are complemented by the women artists’ premium pandanus and sand-palm fibre weaving work. The women of Peppimenarti are traditionally weavers and have transposed their knowledge of fibre and textiles onto the canvas. The results are paintings of intricate, abstract mark-making; some clearly representing syaw (fishnet) and wupun (basket weaving) through their layered textures, whilst others resemble fine tapestries. The mens' art lies in the production of body paint designs and cultural articles. Many of the male artists paint their inherited didjeridu designs. 4. What exciting projects are in the pipeline for your art centre? One of the most interesting projects is the Marrgu Residency Program, where selected creatives are invited to live alongside community members in Peppimenarti for a number of weeks. Participating in daily life, rituals, harvesting and learning, the resident will engage in their own creative or academic practice alongside other community members in an experience about the process of self governed cultural maintenance. A generous invitation to selected participants to develop their practice on country in the small, extremely remote community of Peppimenarti. Access to Peppimenarti is rarely granted to outsiders, and as such, this experience cannot be reproduced or replicated.